Qigong is an ancient form of Chinese medical treatment that is still among the most popular treatments today. Qigong is defined as energy cultivation in the literal form, and depends on the ancient practice of methodic breathing, exercise, and self-massage. It is combined with meditation that helps a practitioner to invoke a person’s life energy, known as qi. The use of this natural form of therapy is not, however, limited to China: it has traveled throughout the world, and is used commonly in both China and he U.S. This type of therapy has been used for thousands of years as a way to lower pain, increase mobility and vitality, deal with mental illness, and treat a person’s overall health. Some of the medical conditions that Qigong practitioners have also used this technique for include high blood pressure, migraines, respiratory problems, stomach conditions, joint pain, and even some types of cancer. Tai Chi is perhaps the most widely-known branch of Qigong practices and is a highly choreographed set of movements that are part of the martial arts family. This form has grown significantly in the United States and often the martial arts portion of this training is not the main focus. Instead, it is used to treat such conditions as limited mobility, poor flexibility, sub par circulation, and to improve the immune system. Tai Chi comes in short and long forms, with the longer form consisting of over a hundred separate movements. This practice can be dated back to early Chinese shamans who used dances as a part of their healing practices. Some of these practices can still be seen today in New Year’s celebrations in China. These early practices have further developed into what we know as Qigong today. This therapy is based on the fundamental thought that qi is the breath of life, or the energy within us. The philosophy behind this is that diseases are the result of the body’s energy being low because of emotional problems or physical exertion. Practitioners of Qigong feel that when the energy flow is blocked it unbalances the energy within the body, making it more prominent in some areas than in others. This causes problems and even inflammation in the area where the energy is pooled. When an area doesn’t have enough energy, it can suffer from a weakened system function. In the early 1970s, an archeologist found the first recorded information on the original version of Qigong, known as dao-yin. This illustrated text is dated to 168 b.c. and displays a group of people going through different movements. Some of these illustrations are even notated with information explaining the disease that the position was used to treat. The popularity of this treatment was clear in the second century b.c.. It did not fade as time went on, but instead it expanded and was further noted in different types of literature. There are three major components of Qigong therapies. All of these are designed to improve health and medical Qigong is one of the three branches of qigong therapy. Medical Qigong is divided between the self-healing practices that involve movement and meditation and the practice of external Qigong. In eternal Qigong another party who is trained in these practices works on a patient to help unblock energies, and, much like healing touch, tries to balance the person’s energy. Spiritual Qigong revolves around meditation and spiritual healing. This area is generally used to help with situations such as a stressful life, as well as improving an overall sense of wellness. 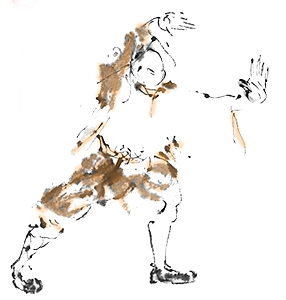 The third and final stage of the Qigong practice is its connection to martial arts. In this aspect, Qigong is designed to help improve the athletic balance, power, and endurance. In this therapy, it can be used to help as a preventative measure to avoid injuries from martial arts practices. Many different sports have taken this philosophy and adapted it to increase a participant’s performance. There are many different types of Qigong styles. These often include such things as animals as a reference point. For example, Qigong uses turtle breathing, which is designed to help promote slowing the breathing and to have an overall calming effect. This type of therapy is highly interactive and requires that a person practice it on a regular basis to ensure that they are reaping all of the potential benefits. Often it is recommended that Qigong be performed daily, as part of a person’s morning ritual. This is a learned therapy. Qigong therapists will teach different movements and ways of breathing to help improve a student’s wellbeing. Qigong can help many different conditions, as it is based to help improve relaxation, strength, and wellness as a whole. This therapy should be considered as an addition to any other treatment a person is undergoing, not a replacement. Because this is an exercise or activity, it is important to check with the primary care provider to ensure that the individual is able to safely perform the movements. Qigong can help to improve the symptoms of headaches including the dreaded migraine. This therapy helps to improve relaxation in the body and can help lessen the feelings of stress that often lead to headaches. Muscular pain, stiffness, and flexibility can also be improved through this type of practice. As the movements are designed to improve the conditioning of the muscular systems along with the energy flow that helps them function, the movements can increase the flexibility of those struggling with tension in their muscles. Asthma has shown improvement through the use of Qigong. Because the therapy focuses closely on the way in which a person is breathing, it is thought that it can improve a person’s respiratory system and help lessen asthma attacks as well as the condition as a whole. Qigong is an “overall person” treatment, meaning it is designed to promote a balance between not only the body, but also the mind and the spirit, improving the way a person feels.